Firstcry Signup Offer: Register here and get Rs 2500 worth cash coupons. Coupon codes will be emailed on your successful signup. Cash coupons includes Rs 150 OFF on Rs 750 & Rs 50 OFF on diapers & Rs 400 OFF on Rs 750 and much more. Join Firstcry family now to avail this new user offer. Firstcry offers flat 30% OFF on Feeding & Nursing on orders above Rs 500. A user will get minimum 30% or the stated discount on the chosen product, whichever is higher. Maximum discount that can be availed with this offer is Rs 3000. 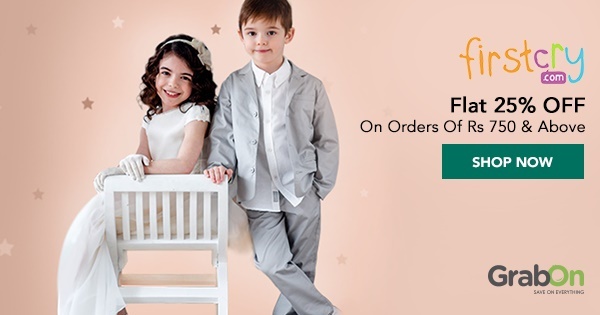 Get up to 50% OFF on kids party wear dresses at firstcry. Fliter using age, brand, color, discount, price range and more. Search from different brands like Fun Time, A.T.U.N, Aarika, Active Kids Wear, Adores, AJ Dezines etc..
Firstcry brings up to 60% OFF on baby and kids footwear. Here you can shop from boys footwear, girls footwear and baby footwear. Here you can select by age also. Get flat 25% off on birthday's & gifts products. Applicable on orders above Rs 750. The Coupon code is valid on Birthday & Gifts Category except on these brands Charlie Banana, Foscam, Melissa & Doug, Motorola, Figaro, Tupperware, Wanna Party, Bio Oil, BeCool, Alex Daisy, Jane, Chicco, Enfagrow, Xbox, Sony Playstation, Pediasure, Horlicks, Protinex, Nestle. Firstcry is offering flat 30% OFF on Mee Mee brand products. Choose from wipes, cotton buds, strollers, learning laptops and more. Get flat Rs 700 OFF on your First cry online shopping. Shop here for baby products, baby furniture, baby care etc worth Rs 2000 to make use of this Firtst Cry discount coupon code. Use these coupons today and get discount on MRP of the products. Firstcry is the best place to shop for all baby products. Flat 25% OFF on Maternity Wear & Maternity Lingerie on orders above Rs 750. The user will get minimum 25% or the stated discount on the chosen product, whichever is higher on order above Rs 750. Firstcry offer - Flat 20% OFF on Bath, Skin & Health Care. The user will get minimum 20% or the stated discount on the chosen product, whichever is higher on order above Rs. 750. Coupon can be used only once & is applicable to MRP of products generated on final cart value after coupon code is applied. Coupon can be used only once and is not applicable to any other coupon. Shop now! Firstcry is offering a flat 30% OFF on Feeding & Nursing range. A user will get a minimum of 30% or the stated discount on the chosen product, whichever is higher. Maximum savings will be capped at Rs 2000. Here you can choose from categories like Baby Food & Infant Formula, Bibs and Hanky, Bottle Cleaning & Sterilisation, Bottles & Accessories, Breast Feeding, Dishes & Utensils, Kids Food & Nutritional Supplements, Maternity Accessories, Sippers & Cups, Teethers & Soothers etc. Firstcry is offering up to 50% OFF on baby furniture. Promo code is not required to grab this discount. Shop here for Cradles & Bassinets, Baby Basket & Stands, Cots & Cribs, Playpen / Play yard, Napper Baby Bed etc from top brands. Firstcry is offering up to 45% OFF on baby bathing essentials. Choose from soaps, shampoo, bubble bath etc from top brands like Himalaya, Chicco, Pigeon, Baby Biotique Herbals, Gohnson's Baby, Dove etc. Also you can buy from bathing accessories like bath tub, shower caps, soap cases, bath gloves, bath sponge etc. Firstcry is the best place to grab huge discounts on your online shopping. Also get FREE shipping on all orders above Rs 499. Firstcry discount coupons are not required to get this offer. Here you can purchase from categories like baby care, baby clothing, books, stationary, baby gear, baby feeding etc. Firstcry offers today: Get up to 30% off on high chairs and booster seats. Choose from baby car seats, baby carriers, baby carrycots ad more. Here you can avail products with features like Removable Tray, Cushioned Seat, With Wheels, Adjustable Recline etc. Select from different colours available. Firstcry is an online portal that provides products for kids, babies, and mothers. Housing more than 1200 leading International and national brands, Firstcry is now Asia’s biggest online shopping platform. Their aim has always been to deliver the best of baby care products to the larger customer base. Firstcry started their journey in the year 2010 with the intention to help the mothers select only the best products for their little one. No one understands the concern of a mother better than Firstcry, hence, they have a platform that caters to all the mothers and babies needs. Firstcry makes it a point to make the online experience seamless and easy for the mothers so that they can order from their website. Why select baby products from Firstcry instead of any other store? The reason is very clear that the brand has an in-depth understanding of what newborns need and what exactly a mother wants for her child. The company does a good job at embodying its core objective “Mommy Knows Best” and thereby offers nothing less. The firm successfully blends stylish looks with its range of Firstcry baby clothing. One can look out for the firstCry coupons for clothes to save on the purchase. The firm is dedicated to inspecting and looking into the entire process of manufacturing the Firstcry products. They make it a point to deliver only high-end stock products to the customers. What’s better? Users have FirstCry offers to avail discount on products. Check out their store to get a glimpse of their offering. The company’s product portfolio is ever expanding. From baby and kids apparels to shoes, from toys, school supplies, books, wipes, baby diapers, nursery items, nappies to many more – FirstCry has it all. FirstCry doesn’t just take care of baby needs, they also have a wide range of collection for expecting mothers. The collections include attires, maternity delicates, breastfeeding pumps and more. First-time users are in for a treat! FirstCry has the first time user offer which you can avail once you sign up. Be it bank offers from HDFC, Axis bank or ICICI bank, you can grab the offer if you are using it for the first time. If you are planning to make your payment through a mobile wallet then there’s good news. Most of the e-wallet giants like Paytm, Mobikwik, and others also have the first user offer in place. Register and link your mobile e-wallet account to your Firstcry ID. When you check out to payment gateway ensure you select the wallet option as a payment method and apply your first-time user code. Offers don’t just limit to first time users, there are other incredible offers up for grabs. Be sure to check out for them here before you make the purchase. The sale season is here! FirstCry brings a huge number of products for your little ones at amazing discounts. Get to shop at ease, we mean, both on your spending and shopping journey. What are the things you need to look out for during the sale? The Firstcry toys sale: Something that your baby or child will love. Finally something for the mothers, the FirstCry diapers sale. Yes, moms do need a sale on that. FirstCry clothes sale: Get to buy adorable clothes for your baby and maybe get him/ her to pose for a photo shoot. Precious one is, FirstCry 11 pm Sale, which happens only for 11 minutes on specific days from 11 pm to 11.11 pm. FirstCry combo offers are totally worth waiting for. These combos make your decisions easier. Firstcry is present in major cities like Bangalore, Hyderabad, Mumbai, Chennai, Kolkata, and Delhi. Firstcry is also present in other cities in India. Each city has its own offer, be sure to not miss out on yours. The best way to make the most of your Firstcry online shopping experience is by grabbing the best of Firstcry discount coupons. Right here you get incredible Firstcry coupons which will help you save BIG on most of your purchases. Choose the right Firstcry coupon and shop soon. The Firstcry online offers can help you save on shopping today. To avail these great offers, keep an eye at this GrabOn page. Using GrabOn discount coupons and promo codes you can get discounts that range from 25% to 50% off on multiple products. So browse through Grabon and select the FirstCry promo code that best suits your need and get to save big today. You can reach out to the firstcry customer support for product related or other queries. Like any mom, even you wish to give only the purest and safest products to your adorable kid right? Well, whether you wish to get those eco-friendly products or little cheeky toys that are downright cute, Firstcry is an excellent place to shop for the products, where every product comes with the utmost level of safety and convenience. Your order is delivered right your doorsteps - they gain reputation for their commitment to aid mothering goodness. All products are brought from authorized brands - comfort, convenience, safety, savvy shopping all that are wrapped in a whimsical package - obtained right here.Offering online shopping that is flexible, reliable, stylish and with all the essentials of a baby and kids store, Firstcry.com is undoubtedly an outstanding online store for those who search for high-quality baby and kids' products. They provide the best of the brands and products at the most affordable prices, in addition to this they provide free shipping and good customer care service. Score the savings with online Firstcry discount coupon codes that are exclusively available on this page. This process helps you get great deals and discounts despite the top brands. So what are you waiting for? Grab these exclusive Firstcry offers and discount codes to save more!